In the Roman times, veils were worn to protect the bride from evil spirits. Later on, when arranged marriages were common, they were used to hide the bride-to-be’s features until the union was legal. This ensured the groom didn’t back out of the deal if he disliked his bride-to-be’s look. Nowadays, veils are considered a bridal accessory. However, some brides still wear them for religious purposes. From short and funky to long and flowing, there are many beautiful bridal veils to choose from. Only the right veil will transform you into a vision of perfection. On the contrary, a wrong veil will make your beautiful dress look a little off the mark. Read on to find out the crucial factors to consider when choosing your veil. Veils come in many different lengths. The right length will complement the silhouette of your dress. Consider trying on different veil lengths during your dress fitting to see which one works best with your dress. Short veils like blushers and birdcages tend to give you an informal or retro look and also add some personality. They are great for tea-length and city hall dresses. 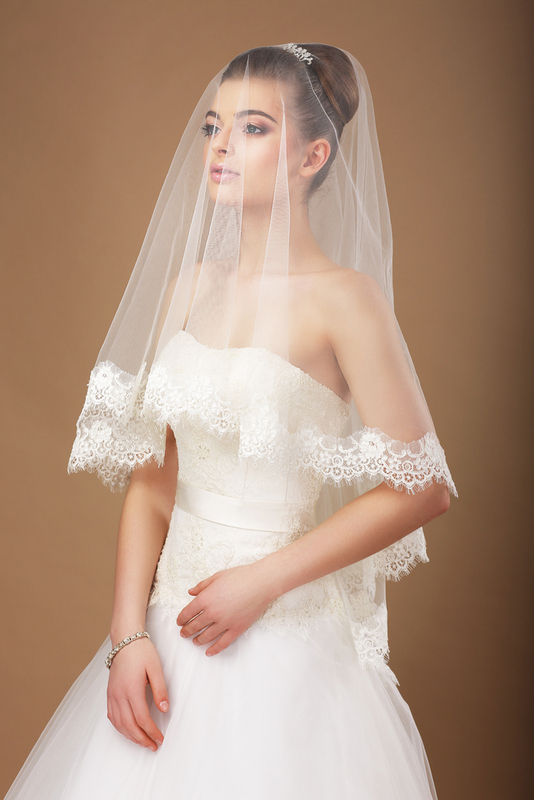 Long veils like chapel and cathedral styles are the most universally flattering veils. They give you a formal and traditional look. As a rule of thumb, the shorter your dress, the shorter your veil should be. Colour is an important aspect because it contributes to your look in photos. A colour difference may be portrayed quite differently by the camera. Choose a veil that is in the same colour as your gown, or something very close to it. The fabric you pick should be ideal for the look you wish to create. Synthetic tulle is the most common fabric. It is also the safest and most budget-friendly option. It holds its shape well both outdoors and indoors. It can create a voluminous look without adding a lot of weight. Silk is the ultimate in beauty and luxury. It is often selected by royalty. It is delicate and can easily tear outdoors. It comes in two different types: soft silk and crisp silk. Soft silk is very fluid, drapey and delicate. You can barely perceive it through touch. It is perfect for vintage style and flowing gowns. Crisp silk is extremely light and transparent. It almost floats in the air, creating a dainty silhouette. When it comes to detailing, your aim should be to strike a balance between your veil and your dress. The two should never compete. Let’s assume your dress has lots of embellishments. If you go for a heavily embroidered veil, it will clash with the detail on the dress. Your best choice would be a very simple veil. The converse is also true. If your dress is simple and unembellished, pair it with a more elaborate veil. Duration, in this case, refers to how long you intend to wear your veil. This factor also helps you determine the veil’s length. If you’re planning to remove it before the reception, you can wear any length and style. However, if you’d like to wear it at both the ceremony and reception, it’s best to wear something more functional. 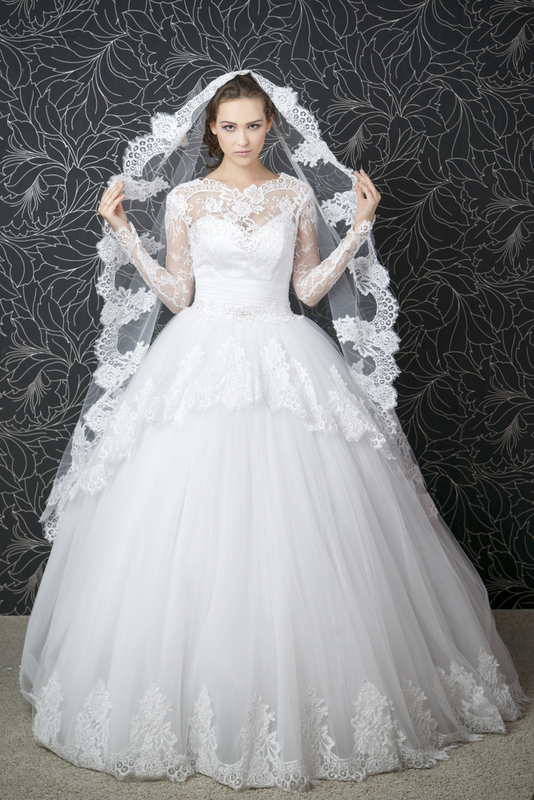 A short veil or a long one with detachable layers would be the best options. They will allow you to move easily without worrying about staining them or tripping over them. You should consider how you plan to wear your hair before selecting a veil. Your hairstyle should support and accentuate your veil. For instance, low updos or hair worn down tends to work best with mantilla veils and bridal caps. Birdcages and blushers are more adaptable and work well with many different hairstyles. If you want to showcase your wedding hair, choose a veil that you’ll remove for the reception or one you can fasten below your ‘do. If you wear your hair up, the veil can be worn on top of or underneath a bun or chignon. Placing it above gives it a more classic and voluminous look whereas pinning it below creates a modern look and draws attention to your updo. After purchasing your veil, remember to take it with you for the trial run so that you and your hair stylist can find the perfect style. These handy tips will help you pick the right veil and avoid any last-minute surprises.